Quintessence on the wrist: The Breitling Navitimer 8 Day & Date displays the day of the week, the date, and the time. Precision, reliability, functionality, and a strong look characterize this wristwatch. Let’s be honest: many office workers look at the dial of their wristwatch at regular intervals throughout the day. The date is also very often the focus of interest, as well as the time. That is why there is still a heated debate about the significance of this indication. The same can also be said about the day of the week – maybe not to quite the same extent, but it is still significant. This is why we also give it a very prominent place on the new Breitling Navitimer 8 Day & Date. 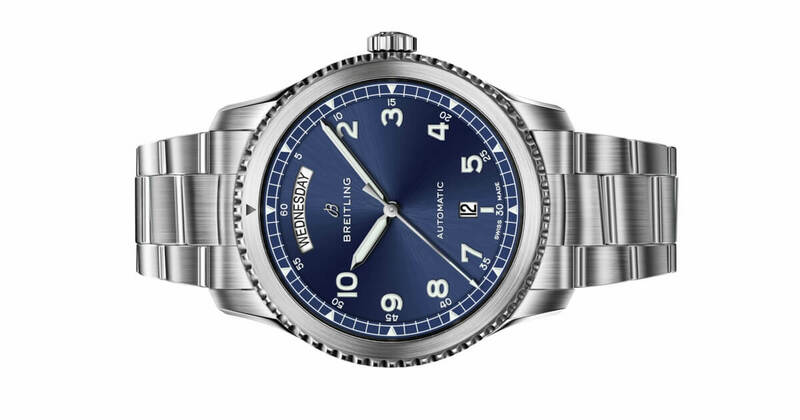 You could even say that it crowns the black or blue dial of this typical pilot’s wristwatch in the style of the 1930s and 1940s. A wide cut-out on the dial guarantees perfect readability of the name of the weekday, which is written out in full, using large black capitals on a white background. On the opposite side, in the south so to speak, the window date is no less perceptible. This arrangement gives the dial a pleasant symmetry, with the hands for hours, minutes, and seconds rotating in the center. The automatic Breitling Caliber 45 movement with four- hertz balance frequency, officially tested for accuracy, serves as the driving force. Its ball-bearing-mounted rotor clamps the mainspring barrel in both directions of rotation. It has over 40 hours of power reserve when fully wound. 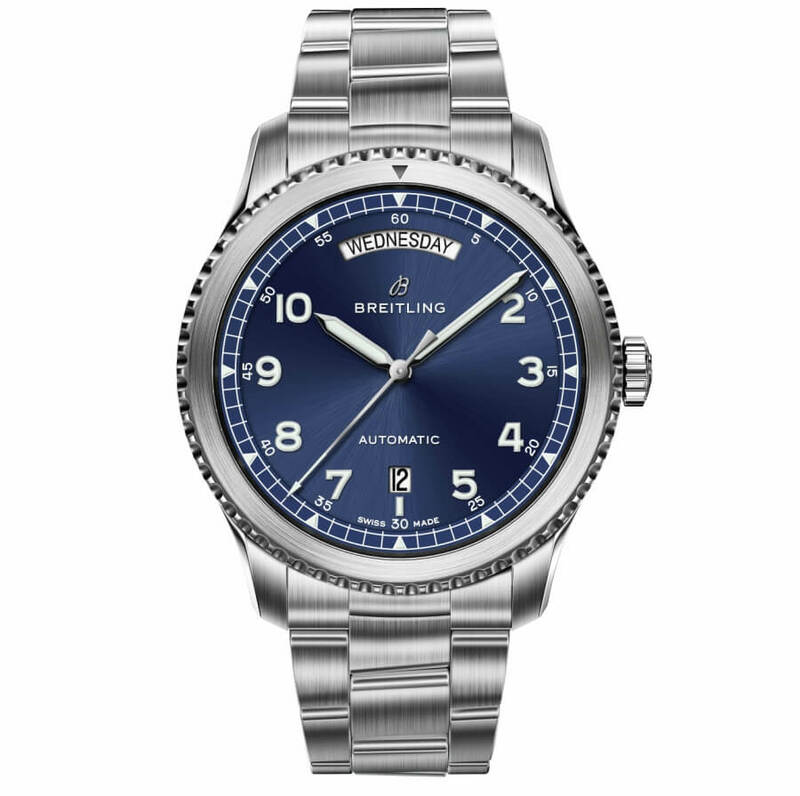 A 41-millimeter stainless steel case with double anti-reflective sapphire glass, screw-on crown, and screw-down back provides protection up to ten bar water pressure. As a reminder of the Huit Aviation Department, the new Navitimer 8 Day & Date also has a rotating bezel with a practical pointer, which can be used to mark the time of an important event, for example the departure of a flight. The approaching hour or minute hand will reliably ensure that you are never late again. This model comes with a supple leather strap with a pin buckle – nothing more is required for the perfect companion on your wrist. 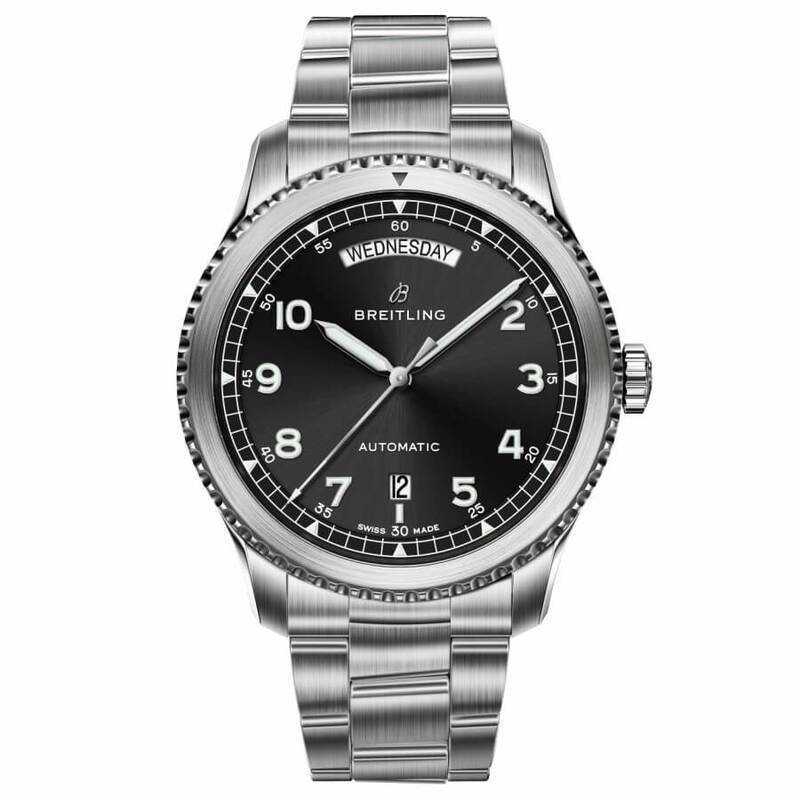 For more visit Breitling Online.